African Leadership Bridge commemorate alumni and new projects during fall fundraiser; featuring African dancers, African music, African food and African speakers. 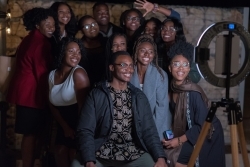 Journey to Africa without leaving Austin, and support bright young leaders. What: The Austin-based charity African Leadership Bridge (ALB) celebrates its 5th annual gala, “A Night in Africa,” Saturday, October 20th, 2018. “A Night in Africa” will be honoring alumni, current students, as well as ALB’s innovative pilot program partners TekZone and Business Innovations for Good (Big Ideas), located in Cameroon, Rwanda and Uganda. This central fundraiser furthers ALB’s goal to raise resources to aid in education and entrepreneurial opportunities for young African leaders, both in the U.S. and on the African continent. This year’s theme focuses on African Proverb “If you want to go quickly, go alone. If you want to go further, go together” and that sentiment can be seen through ALB’s 12-year commitment to education. ALB currently has 5 alumni members that have received degrees from across the U.S., with many graduates from the University of Texas at Austin and one current student, Ukairo Ukario, featured in The Daily Texan and BET, from Nigeria starting his senior year at UT Austin as an Radio-Television-Film (RTF) major. Recent partnerships with TekZone and Business Innovations for Good (Big Ideas) have helped ALB move in a new strategic direction, focusing more directly on inter-Africa educational and training initiatives, with a commitment to empowering woman and underserved communities. ALB’s Founder, Rick Reeder, stated, “We’ve come a long way in 12 years and are extremely grateful and proud that the Austin community has continued their support of our students and work in Africa. With our piloting partners TekZone and Business Innovations for Good, we’ve expanded our reach and are eager to see where this takes us and our partners.” This year’s fundraiser will offer both live and silent auctions, music and dance by UT African Student’s Association, plus authentic African cuisine. This fundraiser is sponsored by several organizations, including Insights Global Learning, Silvia Ward, Fixe Southern House, El Dorado Café, and Blazier, Christensen, Browder & Virr, P.C. When: Saturday, October 20, 2018 from 6PM-12AM. The African Leadership Bridge (ALB) is an innovative nonprofit organization that provides scholarships to promising young African leaders. Joining ALB means more than just receiving a scholarship. We treat our students as part of our family and mentor them through the college experience, ensuring that they build the skills and relationships that will enhance their chances of making a significant impact after graduating. We believe that this experience will prepare these future leaders to tackle important issues with a unique perspective, contributing to the creation of an Africa in which all citizens have an opportunity to realize their full potential. Our team has spent their careers working to improve the lives of underserved groups, engaging in community empowerment through increased access to education, tech, and data. Now we are working to give female entrepreneurs access to skills and resources needed to start up scalable, sustainable businesses and develop solutions to their communities most pressing issues.